By trapping infrared radiation, naturally occurring greenhouse gases maintain the Earth’s average surface temperature at ~33 °C warmer than it would be without an atmosphere. About two-thirds of this warming is due to the presence of water vapour and about one-third to carbon dioxide (CO2); other gases play much smaller roles. As the concentrations of man-made greenhouse gases (particularly CO2 and methane) rise, so does the trapping of heat radiation. As a result, the global average surface temperature rises roughly in proportion to the logarithm of the CO2 concentration. Various schemes have been proposed to control this global warming through geoengineering. The most obvious means of slowing down or preventing further warming is to reduce emissions of greenhouse gases, and this is the path enshrined in the UNFCCC COP21 accord agreed in Paris in December 2015. This espoused the aim of keeping the world to a warming less than 2 °C above the pre-industrial level, a level which has the potential to cause climate change with severe impacts on human activity and the natural environment. This historic event marked a major step forward in international action on climate change but achieving the required cuts in emissions is a major challenge. Indeed, unless global greenhouse gas emissions are reduced to net zero by the middle of the century, it is likely that this threshold will be crossed. Here, “net zero” implies an understanding that it will not be possible to completely stop greenhouse gas emissions emissions and that some technologies to extract CO2 from the atmosphere will be necessary. In the absence of sufficient greenhouse gas emissions reductions, or to buy time to reduce emissions, various schemes have been proposed for large scale intervention in the climate system (Figure 1). 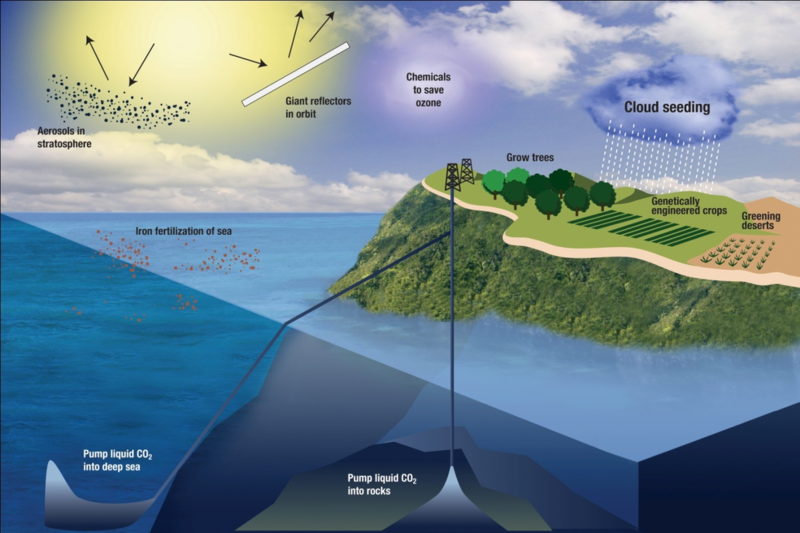 These schemes for geoengineering the climate can be divided into two fundamentally different approaches; carbon dioxide removal and solar radiation management (1, 2). Carbon dioxide removal (CDR) techniques directly remove CO2 from the atmosphere. In the following list, the first two are examples of the “negative emissions technologies” mentioned above. Technologies that can capture up to 90% of the CO2 emissions produced are introduced into electricity generation and industrial processes. The captured gas is then transported by pipeline or ship and injected into geological rock formations from which it is assessed to be vanishingly unlikely to reemerge. Crop waste or charcoal can be buried on land or in the deep ocean. Crops grown for bioenergy and biofuels (although with potential adverse impact on food production) might be utilised with CCS. The potential impacts on ecosystems of all sequestration methods need to be assessed. Methods for sequestration of CO2 from ocean gas platforms in Utsira formations (layers of sand and brine under the sea floor) have already been designed, and might be implemented for other sources, but the costs are high and longevity and leakiness needs to be better understood. Careful planting can help limit the growth of CO2 concentrations, has few side effects (except possible land use conflicts, demands for water or implications for biodiversity) and could be implemented immediately and cheaply. The scope for significant impact is, however, small. For this, the reaction of atmospheric CO2 with silicate minerals (such as olivine) would be accelerated, and the resulting carbon-containing solids would be stored on land or in the ocean. This approach would involve mining, treatment and transportation of the minerals, with significant energy implications. It would also be slow to take effect. “Artificial trees” have been designed to extract atmospheric CO2. The technology appears to be feasible, but again must cope with the problems of scale as well as those associated with CCS. This would be achieved by enhancing photosynthesis by increasing the availability of the necessary nutrients − either by “fertilisation” of the ocean with Fe, P or N or by (wind or tidal-driven) pumping of deep ocean water to the surface. There is currently insufficient evidence to determine whether this would be effective and an important consideration must be the potential for undesirable ecological side effects. Proposed schemes include the launch of trillions of small refracting disks up to the L1 (equal gravity) point between the Earth and the sun or the manufacture on the moon of refractors made from lunar glass. Sulphate particles injected into the stratosphere would simulate the effects of massive volcanic eruptions, which have been shown to introduce temporary reductions in global mean temperature. Of concern here would be indirect effects on stratospheric ozone concentrations and atmospheric acidity. ​It is proposed that this might be achieved by the injection of sea salt particles into clouds (or potentially cloudy regions) from specially designed ships. The salt particles would act as condensation nuclei for cloud droplets and the resulting cloud, composed of more numerous but smaller droplets than might otherwise exist, would have higher reflectivity and, probably, longevity. This might be achieved through the use of more reflective crops, or by covering deserts with highly reflective material, or by painting urban settlements white. These schemes tend to be very expensive and may produce undesirable local ecological impacts. CDR techniques might be viewed as preferable to SRM techniques in that they attempt to return the climate to a more natural state and they would, in general, be safer. However, CDR tends to be very slow to take effect and current schemes are very costly if they are to make significant impact (Figure 2). Furthermore the methods for the carbon sequestration required as part of most of these schemes are not well-proven to be without undesirable environmental side effects. SRM techniques are inherently less safe than CDR methods in that, while they provide a correction to the global radiation imbalance introduced by the greenhouse gases, they do not return the atmosphere to its natural state. They do nothing to reduce other effects of high CO2 concentrations, such as ocean acidification. They also place the climate in an unnatural “High CO2 Low Sun” state under which atmospheric winds and circulations may be quite different and could result in unforeseen impacts on, for example, regional precipitation patterns. SRM schemes have the advantage of being generally less expensive. They would also be easier than CDR methods to implement (or reverse) swiftly. If, however, they were introduced with a view to long term mitigation of global warming, then humankind would be committed to maintaining them into the indefinite future. Any sudden cessation of the SRM would plunge the world very fast into the much warmer state associated with higher CO2 concentrations (3). While the scientific and technical issues posed in the development of geoengineering methods are challenging, possibly an even greater problem would come in addressing ethical and political issues (4). Some schemes, such as capture of CO2 from the air, might be regulated with existing national legislation such as pertains, for example, to air pollution. Other geoengineering methods, such as space-based reflectors or stratospheric aerosol injection, would have large-scale effects, and some regions of the globe may find (or perceive) these to be of greater benefit. There are no clear mechanisms to govern the implementation, operation or control of geoengineering activities, although international agreements concerning the control of nuclear weapons, or indeed climate change, might be used as models. Another ethical aspect (“moral hazard”) concerns the possibility that the very existence of geoengineering schemes might discourage concerted action to reduce CO2 emissions. This is a very serious concern, but I fear that this has already happened. Hence we find a surge of international interest in geoengineering schemes. No geoengineering method has been identified that can address the issue of climate change in a timely, safe and affordable way. The problems of international governance may prove insurmountable. It cannot be stated strongly enough that the safest and most reliable way to combat climate change is to attack the problem at source, to identify carbon-free sources of clean energy and manufacturing and, importantly, to use existing energy resources as efficiently as possible. 1. Royal Society, Geoengineering the climate: Science, governance and uncertainty. Policy Document 10/09, 2009. 2. National Research Council, Climate Intervention: 1. Carbon dioxide removal; 2. Reflecting sunlight to cool Earth, National Academies Press, 2015. 3. A. Robock, this issue, page 19. 4. P. Cox and H. Jeffrey, Physics World, September 2009, p. 24.